Mama MLDB: Whew...what a week! So, it's Wednesday, and I'm finally getting around to writing about last week's festivities. It was a whirlwind of a Spring Break, and it's still winding...and winding...and winding. Tomorrow evening will conclude the 10 day craziness after we host a baby shower at my house. Let me just say that Spring Break was no break. I decided to plan something fun for every day, so that it would be special for the kids, and so Chris would have a little "break" as well. He was working on the basement, and didn't need the kids or I hounding him. Plus, he got to sleep in a little, and do some "planning" for the upcoming demolition. Anyways..let's just say that this was the perfect example of "biting off more than I can chew", because now...I'm EXHAUSTED! Don't get me wrong, we had fun, but it was pretty flipping TIRING! A week full of activities...all while 6 months pregnant was not my best idea. Monday- Movie day. I let the kids each pick out a movie. Alex chose a Holly Hobby fashion movie. Avery chose a Dora sing-a-long. Cal picked Teenage Mutant Ninja Turtles. The first two movies went well. TMNT...not so great. After a few minutes, Alex came out to inform that she didn't think that "this movie is appropriate for children". Then, she asked me if "this" (insert middle finger here) is a swear word. Arghh...apparently, TMNT was not the sweet early 90's cartoon that I remember. The cowabunga was there, but with a few more swords. Monday=flop. 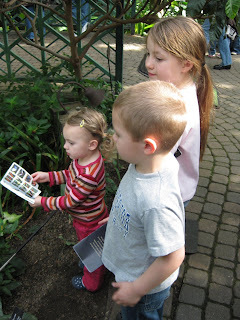 Tuesday- We planned to go to the children's museum, but went to a playdate with my nieces and nephews instead. The kids were good, and had a lot of fun. It was also a nice little break for me. It was nice to have a task force to care for the kids. 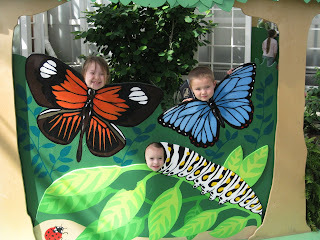 Wednesday- Fredrick Meijer Gardens was lots of fun, but CRAZY busy! I've never seen it so packed. We had to wait in a long line just to get in. I was glad that 2 sister in laws joined us (thanks Jen and Julie!) with their kids, so it made it seem more special for the kids. They liked the butterflies, and the children's garden, but I think their favorite part of the day was the big hill by the DaVinci Horse. They could have rolled down that for HOURS! Thursday- Took the kids to see Despereaux. It was a cute movie and the kids seemed to like it. We had some very adult conversations about bravery and being different. The kids were good, and were VERY excited, because they got 2 lunches that day. (We stopped at BK for them to share chicken and fries before the movie, then they got popcorn, THEN we had hot dogs and fruit when we got home). I don't know why, but they thought it was really cool..who knew. 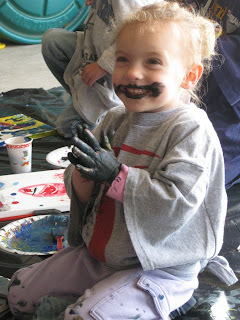 Friday- Art Day....or Mess day! 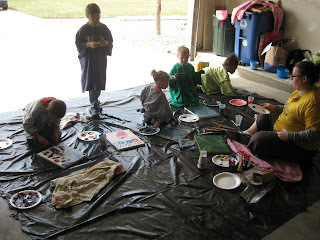 Some friends from across the street came over and we painted...and made HUGE messes. 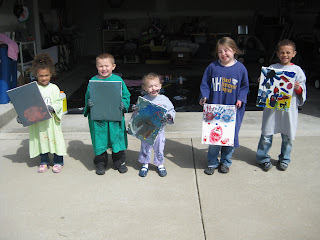 We painted on canvases with acrylic paint, and I talked with the kids about mixing colors (which they mixed all together to make brown), and texture with forks, knives, and different brushes (which they mostly used their hands). We followed up artfest with design your own pizzas, then had a fun dinner with our neighbors and new friends from across the street and called it a day...an exhausting but fun day. Saturday- Woke up early to drive to Romulus...to hang out with Dad, Grandma, Sean and Stephanie. 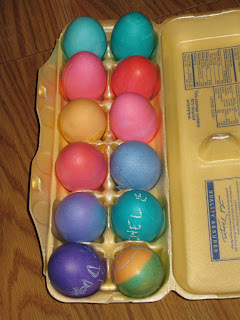 We got to stop by IKEA, and color eggs...LOTS OF FUN! Sunday- EASTER! We woke up, went to church, and came home to get cooking! I always knew it was a lot of work, but doing it myself was a big undertaking. We had turkey, ham, mashed potatoes, roasted sweet potatoes, green bean casserole, stuffing, salad, rolls, pie and caramel brownies. 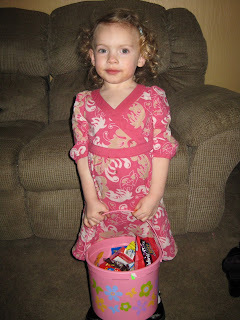 Take all this cooking with the random egg hunt, basket opening, and 2 year old hug, and we had a busy day! We didn't leave until after 9:30 and didn't get home until after midnight. HOLY tired! We had dinner with friends on Monday night, met my dad 1/2 way (a 3 hour round trip) on Tuesday night, Dad is leaving tomorrow (Thursday) morning, then we have the baby shower planned for tomorrow night! I'm really looking forward to Friday. My mother in law is taking Avery, we are making dinner for our neighbor, then we have a grown up night planned...hopefully it will involve going to bed early, and sleeping in late! You are such a trooper. Holy cow, you never cease to amaze me. Wow, that does sound like a crazy week. I love the pictures! Lighten things up a little.